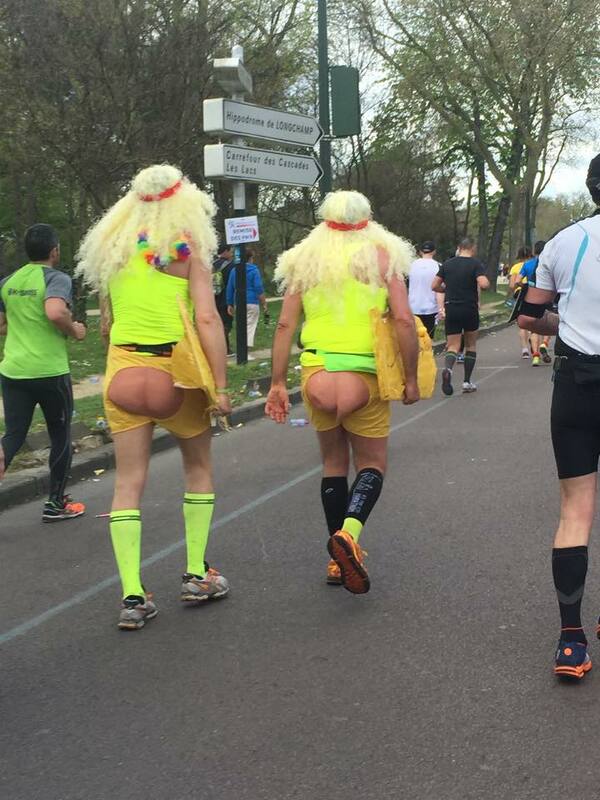 Paris 2015: The Marathon I finally ran! 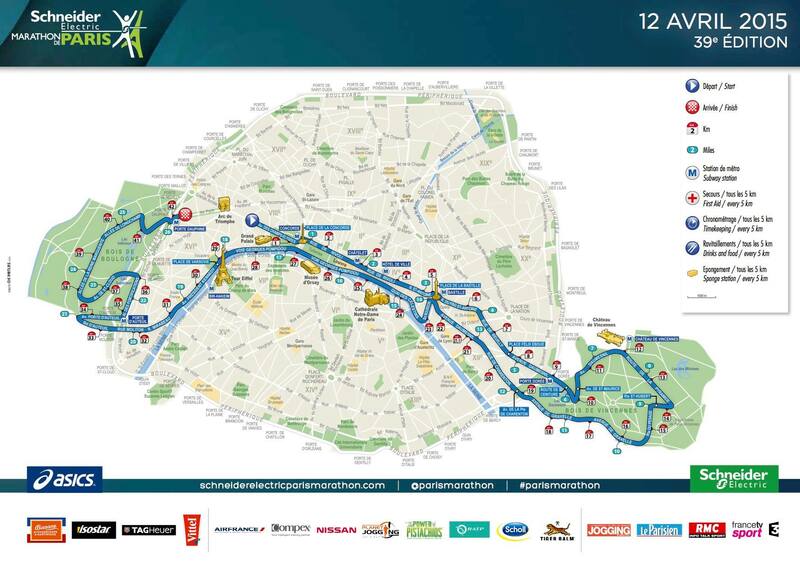 The Paris Marathon has been on my bucket list ever since I moved to the city nearly five years ago. I first registered for the 2011 edition of the race just after moving here. That spring, I got a bad sinus infection that lasted over a month and basically put a stop to my training. I tried again for the 2013 edition. I trained hard through a cold and snowy winter and was in the best running shape of my life. I went all out for this one: raised money for an association in India, told everyone I knew that I was doing it, and even hosted a “Marathon party” (which was a lot of fun). Two weeks before the race, I got a stress fracture and had to stop running for six months. So it was the marathon I didn’t run. That was really tough. Psychologically, I wasn’t prepared to try again in 2014 (I ran two other marathons that year instead). And even when I signed up for 2015, I still felt uncertain about it. But I knew that it was something that I wanted to, needed to finally overcome. I had to at least make it to the start line this year! Sunday was a beautiful day in Paris and finally I was in the starting corral. I was thankful that the departure area was well organized so that we weren’t overly congested in the first kilometers. This was a pleasant surprise, as the Paris Half-Marathon has been quite a different experience in recent years! Yet I was still a bit overwhelmed by the massive size of this race, especially since my last two marathons have been quite small in comparison. And so I started out easy and a lot of people around me made me smile. There were people in costumes, and a pair of surfers passed me up after a few kilometers. We ran straight from the Champs-Elysees to the Bastille, a very familiar stroll for me. Just before km 5, we passed by my French church. I was happy to see a few familiar faces outside, notably Anne and Nathan. I gave them the sweater I had been carrying, as the sun was already warm. I continued on easy and was encouraged to see my Let’s Run Paris friends cheering at km 8. Shortly later we entered the Bois de Vincennes, where I train regularly. Lots of people were running around trying to find a tree behind which to pee. Around km 10 my ankle started hurting (a pain that has been recurring over the past few weeks). I tried to relax it a bit and hoped it would loosen up. I also noticed that a tiny pebble had entered my shoe. It moved with each step, which quickly became incredibly annoying, but I didn’t want to stop to remove it. The sun was bright and the temperature was rising. I don’t do well in heat, so I knew I needed to be careful to not overdo it. Every once in a while volunteers were spraying cold water which was so refreshing to run through. 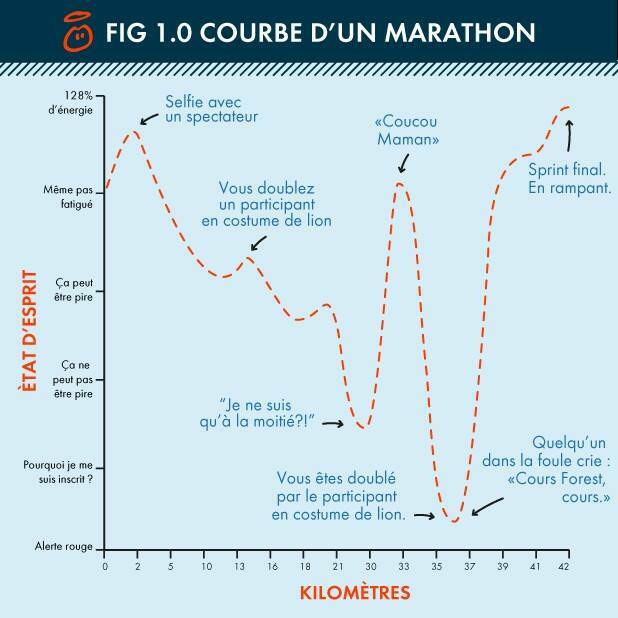 The run was feeling good and as we left the Bois de Vincennes, I anticipated the slight decline ahead on Rue de Gravelle. The musical groups were great, but at around km 16 I think I almost lost my hearing, it was so loud! We were returning to the halfway point at Bastille and the sun was starting to get to me. My head was hurting and I realized I was slowing a bit. I thought of this chart that someone posted on Facebook a few days before the race. I’d say it’s fairly accurate. The halfway point can be a bit of a downer, especially if you think about the fact that you’re only half way there. I figured I just needed to push through until km 34 when I would see the LRP cheerleaders again, but some more familiar faces around this point would have been encouraging. Later I found out that Anne and Nathan were looking for me at the Bastille but missed me. If only I had known I would have looked too! We turned the corner and started running along the river and at this point I remembered standing in that exact spot two years ago, sadly injured but still cheering like a crazy American, “YES YOU CAN! YES YOU CAN!” I was again filled with gratitude that this year I was pounding the pavement rather than standing on the sideline. People have told me about the dreariness of the tunnels along the next stretch, but I still wasn’t sure what to expect. There was, indeed, a long tunnel followed by two shorter ones. The great thing was that they provided shade from the sun. There were also videos, disco lights and what!? Even a D.J.!? And this marked the transition from the “familiar East” side of Paris to the “less familiar West” side. I settled in and waited for how the course would surprise me. Finally we were approaching the Eiffel Tower. I was in pain by this time, but my drive was still strong. Now around km 30, I wondered if it would be better to incorporate some walking intervals through the refreshment area or to just keep running. But when I tried to walk, it seemed to hurt even more, so I just kept running instead. I tried to make myself accelerate, but it was tough. The uphill segments were not at all appreciated at this point! From km 32, I started to calculate my anticipated finish time. I was having bouts of nausea but determined to push forward. The kilometers were still passing relatively quickly. I knew I would see the LRP cheering squad at km 34 and sure enough there they were, along with Ivy who jumped on course with me for the last 8km. I was just trying to focus on closing in on one kilometer at a time, still dealing with some nausea, and she brought enough fun and energy for both of us. She was taking pictures, videos, carried my water and grabbed more water for me when we passed the refreshment points. I was starting to feel dehydrated by this point and couldn’t seem to get in enough water. So it was brilliant to have a water angel by my side! But there was this thing that was annoying me to no end, that tiny pebble in my shoe! I tried to trap it between my toes, but it continued to bounce at every step. Whatever! And then, much to Ivy’s amusement, we caught up to the surfer men! And of course Ivy took their picture. Don’t break under pressure. At km 41 a picture would be taken and automatically posted to my Facebook profile. That kilometer was long as it always is in a marathon. Then came mile 26, then km 42… and at that point Ivy was directed off course because she wasn’t wearing a bib. In my calculations from km 32, I had forgotten to factor in the extra .195, but it was ok because in any case I still finished 4 minutes faster than in Florence. Progressing little by little on this challenging distance, that’s all I require! However, I was really dehydrated by the end. Proof? I went for over 8 hours without peeing! After my arrival, I felt pretty bad and I knew I just needed some water. But the water station was still too far away. Just before I was about to collect my finisher T-shirt, a volunteer stopped me and called for Red Cross personnel, who then promptly took me to the first-aid tent. There they gave me water and checked my vitals. Before long I was feeling better and was ready to leave, but they wouldn’t let me go because my heart rate remained elevated… for over an hour. Finally I got in touch with Franck and Luvyl who finished after me and came to rescue me after I waited there for an hour and a half. After some serious rehydration, everything eventually returned to normal. All in all it was a great experience, the Paris Marathon finally conquered. And now I wonder… shall I give it another shot in 2016 or just be content and move on? 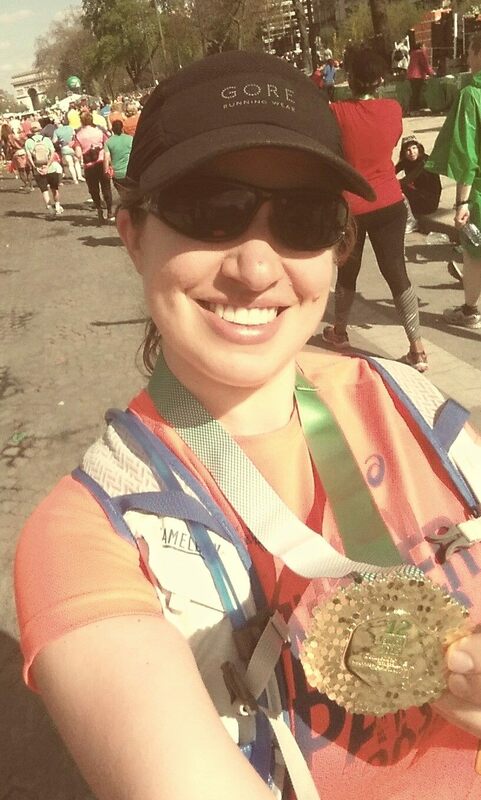 This entry was posted in Paris, Personal life, Running and tagged Paris marathon. Congratulations Noelle!!! What a vivid picture you have painted for me. A note worthy accomplishment for sure!!! !